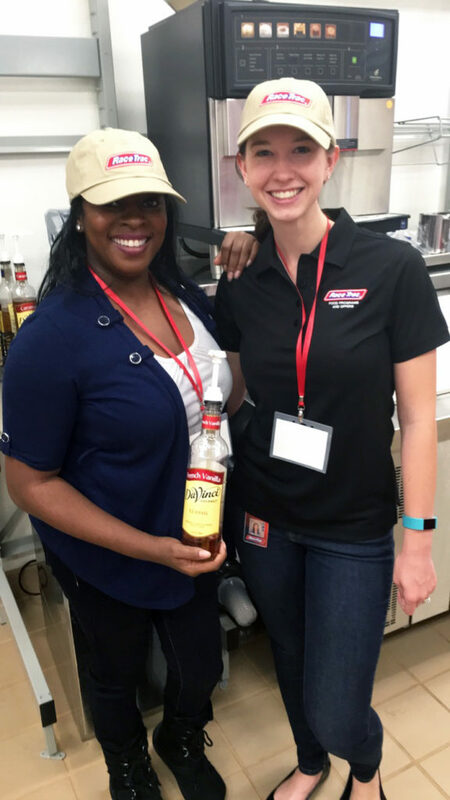 A Trip To The RaceTrac Test Kitchen: Food, Coffee and Whatever Gets You Going! Recently I was invited by RaceTrac to come check out their test kitchen. As a foodie, and knowing loads of our readers are foodies, I knew I had to go get the inside scoop. It’s amazing how much time and effort is put into providing an awesome, comforting and delicious customer experience. Upon arriving, we were treated to some goodies and a presentation about how each department works on their various crafts. From perfecting coffee and snacks to creating their own candies and ice cream I was drooling by the end of the presentation. The cool part was learning that while most people think about coffee being a morning “go to” RaceTrac’s mission is to make people’s lives simpler and more enjoyable, in keeping with that mission they have found that there are many different foods and drinks that get people going in the morning. This is why they’re currently doing a “Whatever Gets You Going!” campaign. Over the next few months, as we close out 2016 I’ll be sharing a few things to help get you going to finish up the year and then we’ll continue into 2017 to help get you going as you bring in the NEW year right! While I love RaceTrac food and snacks, that’s not the only reason I took on this campaign. RaceTrac was actually the first place my mother worked in when we moved to Georgia. I remember going to her job after school sometimes or after dinner to go keep her company and pick out candy when I had made good grades. The first location she worked in is no longer there but the second one she worked in is still around and every time I pass it I get a feeling of nostalgia. So… as you can see RaceTrac definitely holds a special place in my heart. I was really happy to see that everyone had to wash their hand first before entering the test kitchen, lol. As a recovering germaphobe, my tour started off great LOL. Wine always gets my day going! Finished off the day with some Photo Booth Fun! What Gets You Going Everyday?